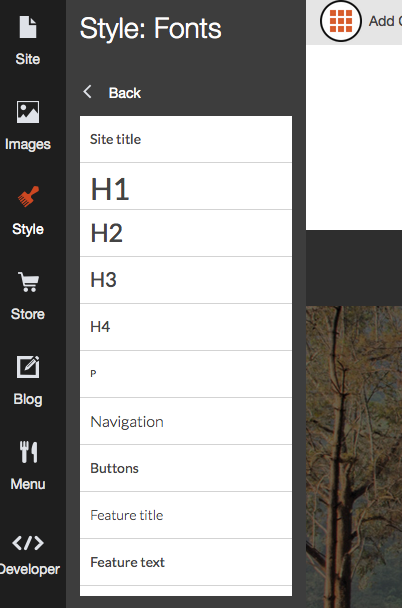 The Style tab allows you to change the style of your whole site. 1. By clicking in Browse templates you will be able to see all the templates included in your account and you can change your template whenever you want. 2. 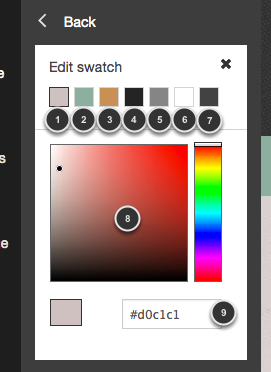 The Colours option allows you to change the color swatch you are using or edit your own swatch. 3. You can select either a solid color, a gradient or an image as your Background. 4. 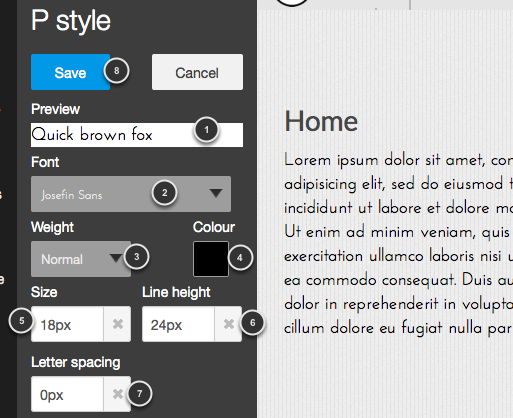 Change all the fonts and font style across your site with the Fonts button. All our templates come with 5 different color swatches (1) created by our professional designers to make the best out of your template. 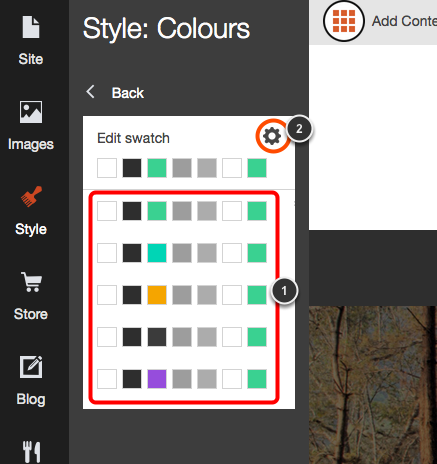 However, if you want to use your own colors, you can do it by clicking in the settings icon (2). 7. Lateral navigation menu (if any). 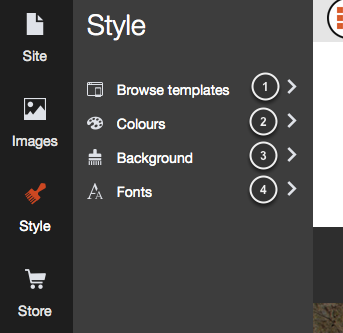 The background button in the Style tab offers 3 options to change your background. You can either choose a Solid Colour (1), a Gradient (2) or an Image (3). 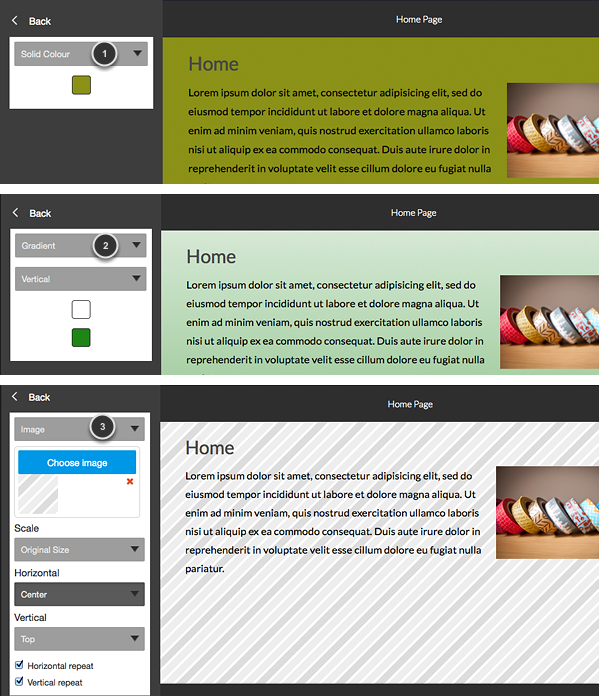 When changing the Fonts style, you will be changing the style all across your website. Just select the kind of text you want to change (for example 'p' or 'paragraph'). 1. Here you can see how your font will look on your site. 2. Select the font from over the 35 fonts we offer in the drop down menu. 3. You can choose between a normal weight, bold or light. 4. Change the color of your font. 5. Click here to change the size of your font. 6. The Line height will help you setting the distance between lines. 7. The default letter spacing is 0px, but you can make it larger or smaller. 8. Save your changes when you finish.